This is one of the numerous posts that has been languishing in my drafts folder for months now. Blogging is beginning to seem like "work" these days! Coat four small ramekins or custard cups lightly with flavorless oil. I used small steel tumblers. Pour about ¼ cup of the cream into a small microwave safe bowl, sprinkle the gelatin over it and let stand until softened, about 5 minutes. Microwave for a minute or so and mix well until the gelatin has dissolved. Meanwhile, in a saucepan over medium heat, bring the remaining cream, mascarpone cheese, sugar and salt just to a boil. Remove the pan from the heat, add the chocolate and whisk until smooth. Add the gelatin mixture to the chocolate mixture and mix well. Divide the mixture evenly among the ramekins and let cool to room temperature. Cover the panna cotta loosely with plastic wrap and refrigerate until set and thoroughly chilled, at least 3 hours or up to 1 day. To serve, dip the ramekins one at a time into a bowl of hot water for about 20-30 seconds to loosen the custard, and then run a knife around the edges and invert onto a chilled serving plate. Serve the panna cotta with the strawberry sauce spooned over the top. Garnish with toasted walnuts. Serves 4. Add all the ingredients to a saucepan, warm on low-medium heat till the sugar melts and the strawberries get mushy. Cool and blend well to get a sauce-like consistency. Strain if you must. 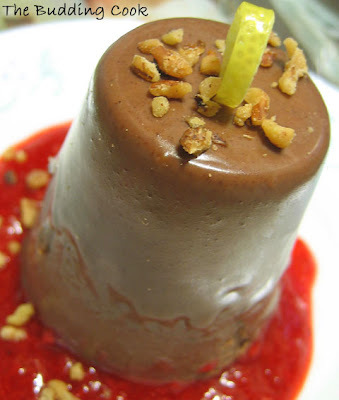 Serve over chocolate panna cotta. Looks fantastic! I haven't tried making pannacotta yet. As everything else on your blog, this looks really delicious. Oh, no! Blogging is supposed to be fun. It's NOT supposed to feel like work. LOL! Perhaps a short break is in order? Take it easy and have fun. I am not exactly sure what this is but looks deadly. Now that we have scorching heat here, this one makes me drool! slurrrrppppp..... I am a sucker for panna cotta, and this looks delicious! TBC, you and I need to figure out a way to sample each other's dishes. That pannacotta looks sinful! thats an absolutely yummy pic! makes me want to just get a spoon and dig right in! Blogging's beginning to seem like work? Does that mean you're beginning to get obsessed about it, like some of us? That looks so nice never tatsed it... bookmarked. and that is one gorgeous creation! great TBC you bloggers are great, what all things you make. urs is looking awesome. just wow. OMG, I Love pannacotta. This looks gorgeous. Thank you for the recipe. take it easy, blog only when u can & feel like it! Made and presented beautifully, TBC! I have been on the look out for vegetarian gelatin for this one! Panna cotta with mascarpone cheese...pretty! The panacotta looks glorius, like a chocolate tower. Fab job! Laavanya- I should try the pain one now. :D And thanks! Paz- you are too kind. :D I am indeed going on a short break. Just wanted to post all the pending posts before that. Siri- thank you! :D How's the new job? Sia- :D The problem for me right now is the large number of pending posts which I would like to publish before I take a short break. JZ- awww, what a nice thing to say! So what did u finally make for your picnic? oh yeah! picnic was fun, made chutney s/w, my fav peach lassi & a cake, turned out real good ;) thanks for the pasta info, want to try that one with summer tomatoes!